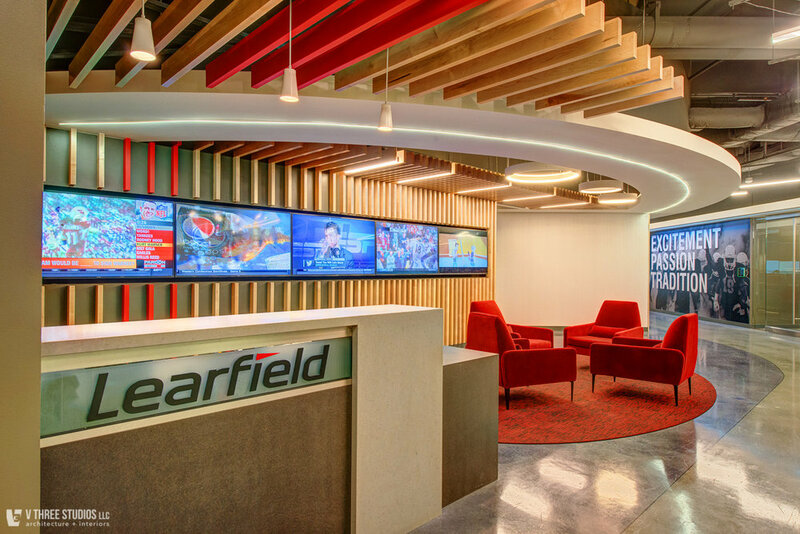 Learfield, a leading collegiate sports multimedia and marketing firm, recently worked with longtime partner V Three Studios to retrofit its Plano, Texas headquarters into a collaborative, idea-driven environment for the company’s innovative staff. The new space needed to accommodate the company’s growth from a traditional broadcasting business to a broader media content creator, as well as meet the demands of today’s media technology. V3’s knowledge of the evolution of technology in media broadcast, as well as their understanding of Learfield’s identity and passion for college sports, made them the natural choice for the project. 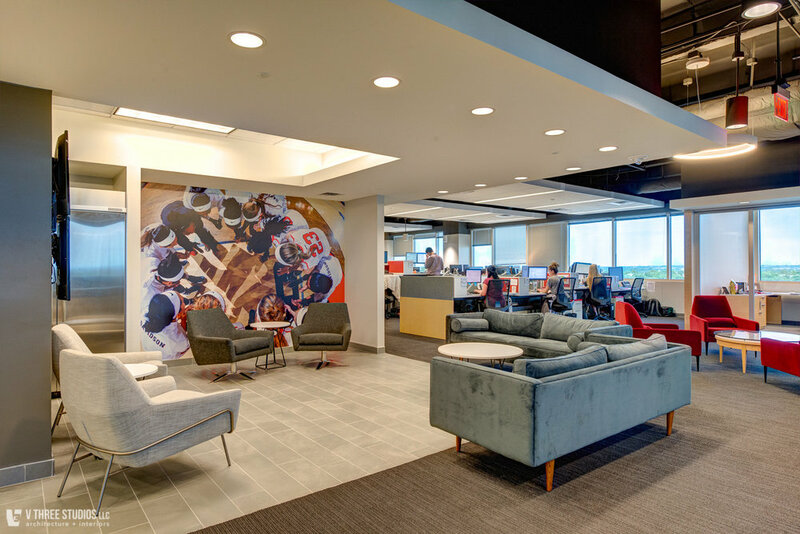 The features of the renovated 5th floor suites include collaborative spaces for Learfield’s internal marketing, sales and content development teams. A major goal of the project was to break up any company silos and allow employees to become more connected. 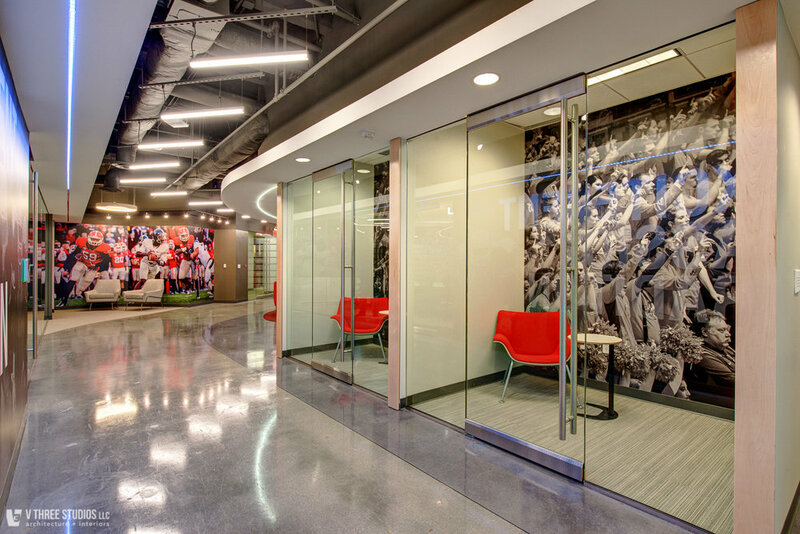 V3 was able to create the desired open environment by minimizing private office spaces, using fewer walls and utilizing glass where acoustical separation was needed. Strategically placed glass fronted “phone booths” were introduced for phone calls and one on one meetings. A new open format break area encourages employees to work, collaborate, and create in different settings. Together, each of these features contribute to a more nimble and productive multimedia and marketing company ready for the future.